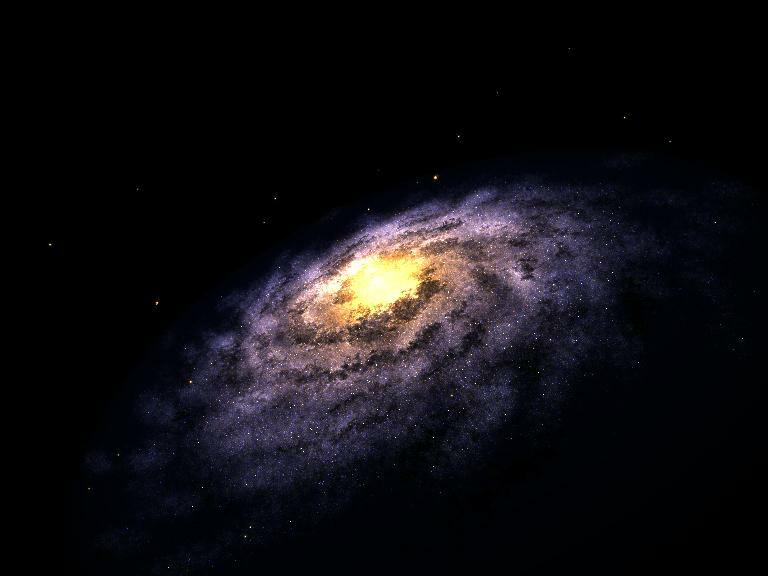 Catalog objects - images rendered from models of other galaxies. Milky way - images based on a radio map of our own galaxy. Early work - some of the earliest images. Nebulae - attempts to model nebulae. ATSOS - project revamp; new developments 2009+. For many years, on and off, I have been developing software to render galaxies and associated phenomena. The images typically contain around 20-60 million stellar objects (i.e stars and dust clouds). Note that this is still too small by about a factor of 10000! The software uses a variety of techniques including volumetric rendering and ray-tracing. Astronomical data and astrophysical models are used as input where practical. Several animated sequences have been produced, and featured in various TV programmes such as Pioneer Production's "Universe" series shown on Channel4 in November 1999, a Horizon programme on supermassive black holes broadcast October 2000 and the BBC's production of "A For Andromeda" in 2006. Images and animations (from library stock or rendered to your specification) are available commercially through Planetary Visions Limited (care of The Department of Geomatic Engineering, University College London).